Every year, 3 million hikers, climbers, fishermen, hunters and nature enthusiasts flock to West Virginia's Monongahela National Forest. Yet not much is known about the extensive restoration efforts that have brought this once-degraded forest back to health. Within a day's drive for half of the U.S. population, the Monongahela National Forest is today one of America's most ecologically diverse areas, a critical hotspot for the historic red spruce-northern hardwood ecosystems across the high elevation landscapes of Central Appalachia and the threatened hellbender salamander. It wasn't always like this. In the 1800s through to the early 20th century, these temperate forests were razed using poor practices for a variety of timber and wood-derived products. These activities and the wildfires that followed resulted in excessive erosion, water runoff and other problems that affected both local and downstream communities. 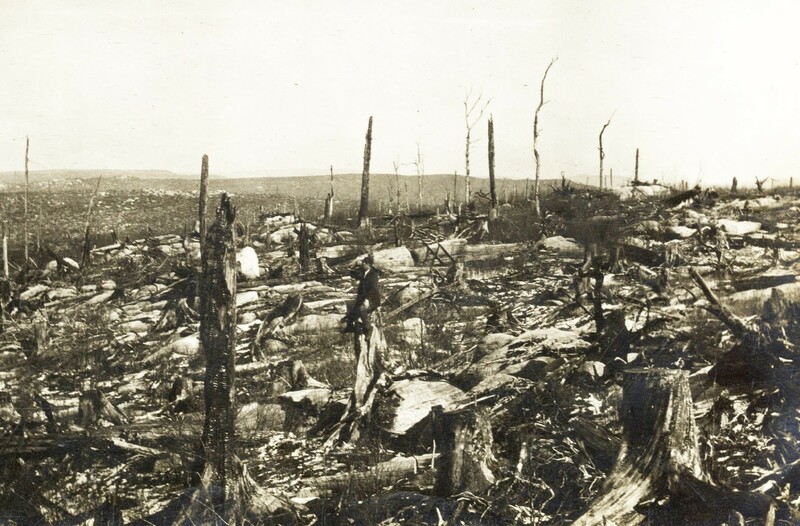 After extensive logging in 1905, the Dolly Sods area of Canaan Mountain was left desolate and susceptible to further destruction by fire. Photo: courtesy of the Monongahela National Forest. In 1915, the first 7,200 acres that would later become the Monongahela National Forest were purchased to protect the headwaters of rivers and streams and to encourage responsible natural resource management. With awareness growing about the importance of nature and the rise of wilderness tourism, forest management expanded to include other priorities such as recreation and biodiversity. Today, the United States Forest Service (USFS) manages the forest—now encompassing more than 919,000 acres—to ensure the provision of important ecosystem services and to allow society to enjoy the environmental and recreational value that it provides. 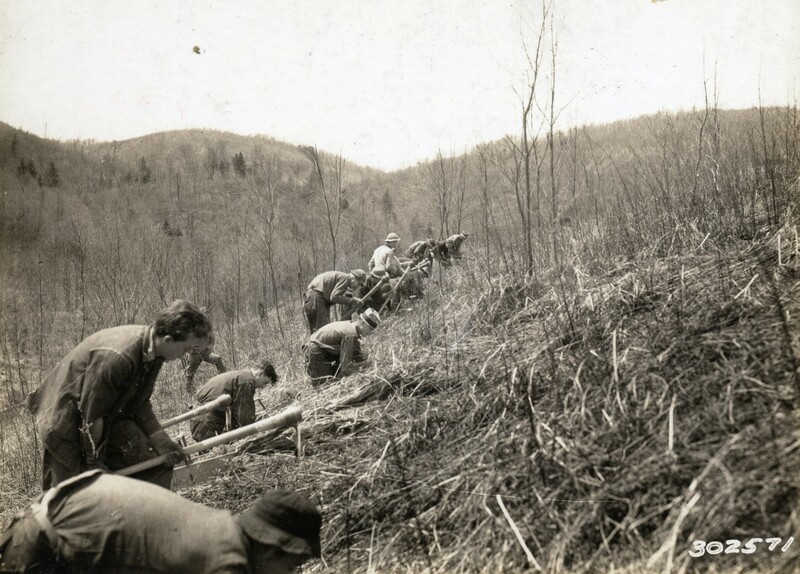 Tree planting efforts on Hinkle Run in May 1935. Photo: courtesy of the Monongahela National Forest. 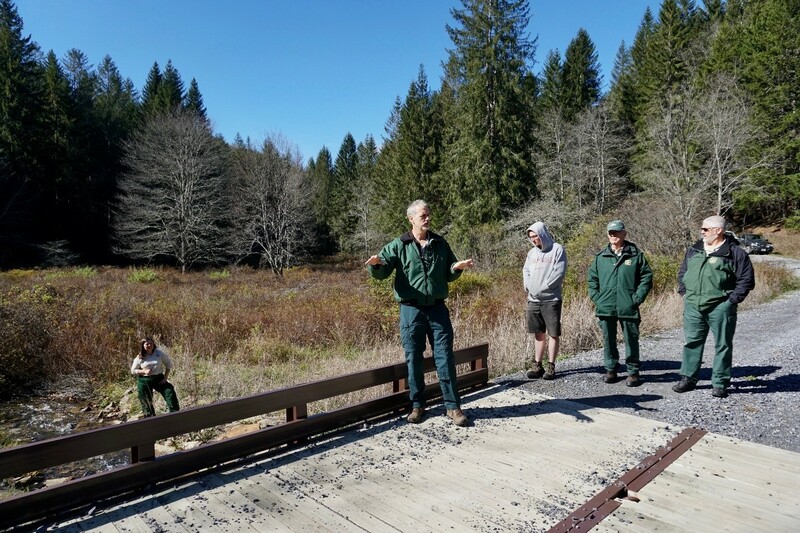 In October 2017, we joined our USFS partners to learn more about their efforts to restore the Monongahela National Forest. Our work with the Global Restoration Initiative has mostly focused on drylands and the tropics, for example in the semi-arid landscapes of Niger and the peatlands of Indonesia, and less so on temperate forests such as the central Appalachians. By visiting the Monongahela, we learned how experiences from communities and projects closest to home can lead to newfound insights for our global work. Restoration has played a key role in some of the Monongahela's biggest achievements: restoring red spruce forest ecosystems to increase biodiversity and soil carbon stocks, restoring cold mountain streams to provide habitat for brook trout and other iconic species, and rehabilitating old coal mine sites with new restoration techniques to re-create more natural conditions. Drawing on the expertise of the USFS, we are now applying lessons we learned from them to our restoration work around the world. 1. 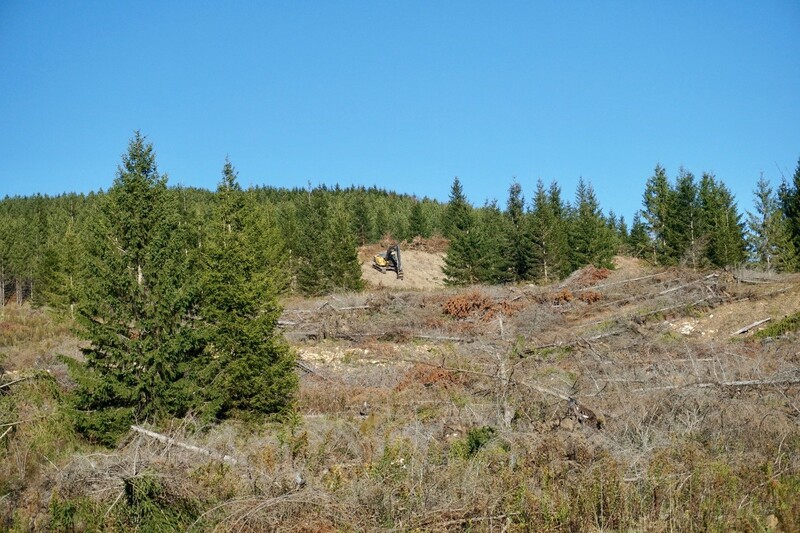 Restoring Red Spruce to Combat Climate Change and Support Biodiversity. Red spruce trees used to be a common component of the central Appalachians. Today their extent is reduced to only a small fraction of their original range—mostly in high elevation forest patches—due to intensive logging, fire and land use changes. However, the red spruce ecosystem remains important, providing many valued benefits, such as upland water storage, soil carbon sequestration, and habitat for threatened, endangered, and sensitive species like Cheat Mountain salamanders and Virginia northern flying squirrels. "Different soils have the ability to store different amounts of carbon, and Appalachian soils have the potential to store a lot of carbon for the long-term if managed correctly. There is evidence of this in the soil profiles under the historic red spruce ecosystem," according to Stephanie Connolly, soil scientist at Monongahela National Forest, at Barton Knob on top of Cheat Mountain, during our visit. Recent data suggests that in West Virginia alone the carbon equivalent of 56 million barrels of oil can be taken out of the atmosphere and incorporated into the forest floor within 80 years, if managed correctly. The Central Appalachian Spruce Restoration Initiative, a diverse partnership of private, state, federal, and non-governmental organizations, is restoring red spruce across portions of its former range on both public and private lands. We heard firsthand accounts from local Appalachian project teams working with The Nature Conservancy to remove hardwood species like beech that outcompete regenerating red spruce. Thinning these competing hardwood species and planting red spruce seedlings allows the red spruce, as well as the many organisms that depend on it, to return to the Monongahela. In this way, the USFS and their partners are restoring the forests to create a better habitat for wildlife and to withstand and adapt to climate change. 2. Restoring Cold Mountain Streams Helps Spread the Wealth Locally. Working with the USDA Natural Resources Conservation Service and community-based organizations like Trout Unlimited, the USFS is restoring the cold-water mountain streams that run through the Monongahela National Forest and neighboring private lands. Restoring the streams sometimes involves mechanical intervention—building fences to exclude livestock, placing large log structures and boulders in the streambed, or reshaping straight and dredged channels—but it always includes the restoration of trees and vegetation along the riverbanks to provide shade and control streambank erosion and instream siltation. West Virginian farmers were once skeptical about the restoration efforts until they started to see the benefits of the projects firsthand: the return of the iconic West Virginia state fish, the brook trout. Local pioneers like Dustin Wichterman from Trout Unlimited are working with land owners to restore their streams. Those landowners are recounting their successes to neighbors, who are now building fences and planting riparian trees on their land. And now that the abundance of brook trout is increasing, farmers are appreciating the benefits of cleaner and healthier streams and the role that the restoration activities played in getting there. Importantly, brook trout fishing is big business in West Virginia, and the increased presence of anglers is strengthening local economies and giving the West Virginia communities a welcome tourism boost. Spreading the wealth locally has helped raise awareness and positivity around these local restoration projects, converting important stakeholders, and allowing the projects to be more impactful for both people and nature. 3. Rehabilitating Old Coal Mines Shows the Value of Being Adaptable. In the 1980s, parts of the red spruce forests, including 2,000 acres of the Mower Tract on Cheat Mountain were strip-mined to remove coal. Today, these former coal mines are part of the Monongahela. When the USFS acquired the mine in 1989, the mining company had restored the land with non-native Norway spruce and red pine. The trees were planted too close together, providing little habitat for wildlife and no room for native species to regenerate. The USFS is now partnering with key local stakeholders, like Green Forests Work and the Appalachian Regional Reforestation Initiative, to remove non-native trees of little biophysical and monetary value, restore soil quality through decompaction, plant red spruce seedlings, and improve habitat for native wildlife. By using the latest scientific knowledge and tools and developing adaptive management plans they hope to restore this site to a more natural ecological condition. First, they remove non-native species and break up the soil—a process called "deep-ripping"—with the help of a bulldozer. They leave the felled tree trunks and branches on the land to "load" the area with organic matter which encourages new growth and the creation of mini-wetlands. Finally, they plant native species. Together, these efforts create an early successional habitat that is perfect for red spruce and the wildlife that depend on it. As USFS Research Hydrologist Pam Edwards highlighted on our excursion, "to restore these lands best we must never stop adapting." The lessons we learned from the Monongahela enriched our cookbook of recipes for restoring forests and landscapes. The practices we observed, along with their continued adaptation, are living tools that we should harness now and for generations to come.